The real value of insurance is not just determined by insurance rates. The ability of the company to cover insurance claims, and the ease of the process when the policyholder makes a claim, are also very important. This is vitally important for home insurance in particular because a home is one of the largest and most valuable assets most Canadians will ever own. 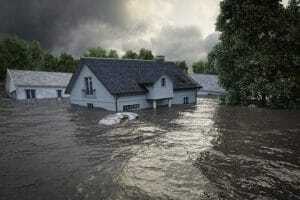 The last few years have seen an increase in the volume and cost of home insurance claims due to floods and wildfires on the western and eastern sides of the country. InsurEye, an independent Canadian insurance review platform, has analyzed more than 2,000 consumer reviews to develop key insights about the home insurance claims process. Their findings are listed below and it makes sense to consider them when getting home insurance quotes. While home insurance claims are very diverse and include flooding, fire, theft of jewelry and damages to the home thanks to a rowdy pet, the most frequent claims stem from water damage. There are many categories of claims due to water damage: overland flooding, roof leakage, plumbing issues, flooding caused by issues in other units (in apartment-style complexes), water seepage, etc. In fact, out of all the reviews InsurEye analyzed, about 49 per cent of the claims were for some kind of water damage. Approximately 16 per cent were from fire and smoke damage, 11 per cent were from hail damage and 9 per cent were from break-and-enter. A handful of claims came from rare scenarios, such as a car driven into a home or pool, or damages from a faulty oil heater. You should know that some types of claims are less relevant for particular types of home insurance, e.g. when getting a condo insurance quote, you should be less concerned about overland flooding or sewer backup (both are water damage claims) since these are typical claim types for standalone houses with basements. 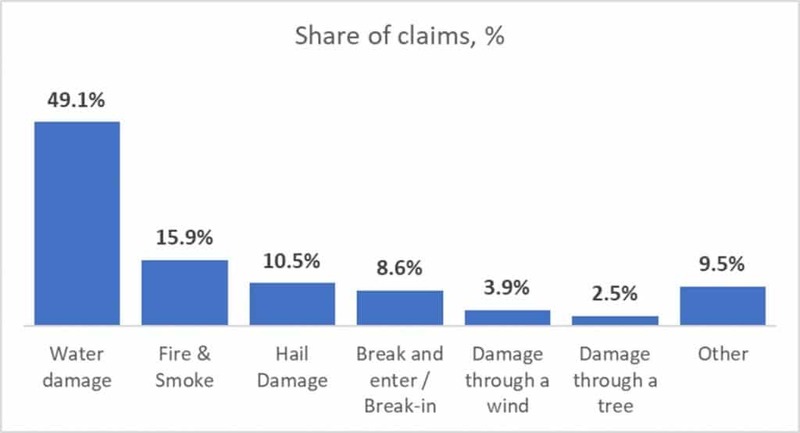 When we assessed factors that people mentioned most frequently while talking about their home insurance experience, the speed of claim handling was mentioned by about 39 per cent of policy holders. The proper settlement amount was the second most important factor; it was mentioned by approximately 26 per cent of consumers, followed by sympathetic and helpful adjuster services, which were listed by 18 per cent. The formula for successful claim handling for insurers is simple: deal with claims in a speedy manner, pay fair and be friendly. A few cherries on top are: waving deductibles and helping with temporary accommodations. Some home insurance claims are very complex and involve an assessment, restoration services, multiple contractors, temporary accommodations and more. With so many moving parts to a claim, things can go wrong quickly. 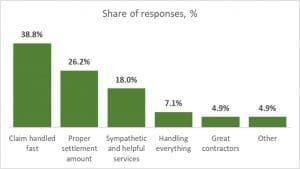 The main thing that consumers want addressed is when a claims adjuster and/or the support staff are rude and unprofessional. In fact, 22 per cent of negative feedback against home insurance carriers is due to this issue. Nineteen per cent are frustrated by the second most frequently mentioned issue: a long or dragged out claims process. Although it comes in third on the list of client frustrations, this last one is the most painful: 16 per cent reported denied claims. That means one out of every six claims were not paid out. Other issues include insufficient reimbursement, poor quality work from the contractors and misleading coverage information. See the chart below for more on this topic. What can you do to improve your chances of a fair pay out? Although there is often a chance that an insurer will see the situation differently than you and will not pay, there are numerous things you can do to maximize your chances of receiving a fully paid out claim. Understand your policy: Understanding what is covered and what is not is very important. Make sure you take time to understand your policy. Ensure that you are covered for overland flooding: This coverage is typically optional – make sure that you are covered for this risk. Typically, you’d need an optional coverage called an overland flooding endorsement, or overland water endorsement. Ensure that you are covered for sewer backup: This coverage is also optional and often needs to be purchased separately, but it is relatively cheap. Ask your broker or insurance provider for a sewer backup endorsement. Understand your deductibles and limits: These are two key numbers. Some risks are covered only up to a particular amount, so make sure that you are comfortable with it. Some providers require very high deductibles, arguing that they are there only for large damages. Make sure you are clear about your deductibles – it will be the amount you have to pay out of pocket before your insurance coverage kicks in. Document everything: Being able to prove what items and upgrades you are referring to in your claim means that it will be harder for an insurer to ignore them or lowball you on costs. Make sure that you keep major receipts, or at least scans of your receipts. A good habit is also to walk through your home every six months and make a photo journal or quick video of everything in your dwelling as both proof for the insurer and a reminder to yourself of what to claim. Your own contractor: Confirm with an insurer that you can use your own contractors if there is such a need. Some insurers will use only their own low-cost contractors who do not always deliver the best quality. Pay attention to insurance reviews: The true face of an insurer is visible once the company needs to stand up for your claim – will they pay easily or fight for each cent and try to lowball you? These are questions that only insurance reviews can answer. Escalate earlier rather than later: If the claim does not move forward at a reasonable pace, be clear about your experience and escalate the situation to a manager–or higher, if needed. Stay fact-based and rely on evidence. In most cases, insurers want to provide fair service. Use the media as leverage: In some cases, simply mentioning Globe and Mail, National Post or Toronto Star can help. Still no help and your case is serious? Many journalists, for example Pat Foran’s consumer show on CTV, will be happy to share your personal experience story. Maintain your home in great shape: Some claims result out of bad maintenance – leaking roof, old wiring, outdated plumbing – so make sure your place is in good shape. We hope you found these insights and tips helpful. Remember that your home is often your largest asset. Make sure it is protected properly.